Follow the Stepaside road straight up and past the Step Inn. Keep following the road until you see a blue wooden Church on your right. Take the next right hand turn onto Ballybetagh road, follow directions towards Johnny Foxes. After approx. two hundred yards, you will encounter an extremely sharp left turn on the road. On this turn, in front of you is a lane called “Bishops lane”. Carefully go down this lane and take the first left hand side turn when you see the ruin of an old Church and graveyard. (Don’t go straight on!) Follow the lane (still Bishops lane) which turns right and left, go past large horses’ stables on your right and the next house will be Alpine Cattery. 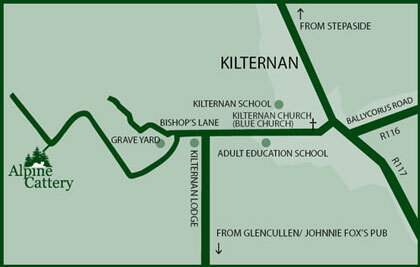 Take the exit 15, sign-posted Kilternan, which will bring you past “the Park Carrickmines” shopping facility. After this is a small roundabout, take the second exit off this on to the Carrickmines road. Follow the straight road until you reach a T junction with Palmers pub in front of you. Take the left turn and follow the road for a short distance, until you see the blue wooden Church. Follow the road from Enniskerry village towards the scalp. Pass the Kilternan sports hotel on your left, keep going straight until you see a Stat Oil garage on your right hand side. There will be road to your left called Ballybetagh road which will lead you to Bishops lane.